(Misch, 2003) The Great Bog was a magnificent continental land-mass in the Great Telescope. Its basalt-covered plateau appeared windswept and mottled. There were dark kernels especially along the neck of the Syrtis, including a large blackish mass around the cone of the shield volcano itself. The dark-filled Huygens crater was always visible. Sheehan saw Hellas as a dull grayish mass; brighter in its southern part, a delicate swirl-like pattern in its northern part that at times almost resembled a spiral. To Misch, it presented a broad plain enclosed by a nearly circular dark ring, looking at times like some huge ornament crowning the forehead of Syrtis Major. In views reminding us of - and perhaps suggested by - Antoniadi's great six hours of perfect seeing with the Great Meudon Telescope on September 20, 1909, Mare Tyrrhenum sometimes broke into a leopard-skin pattern of spots. Mare Cimmerium and Mare Sirenum on the other hand appeared streaky in texture - recalling Barnard's comment that the planet looked as if it had been painted with a bad brush. These views were dominated by the elegantly curving Sinus Sabaeus, which looked like a serpentine ribbon drawn across the disk. 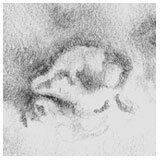 In the best seeing, the outline became ragged, and the bright-floored crater Schiaparelli, corresponding to the classical region Edom, was notable. For Misch, this region was the most readily captured on paper. "The assertive curve of Sabaeus, with its clawed end, reaching far across the planet just south of the equator, provided a strong anchor for the eye, a frame of reference against which subtler features could be gauged." The northern border of the dark region running from Margaritifer Sinus to Aurorae Sinus, with all its windswept projections, appeared lighter and lower contrast in comparison with the region south of it. A broad dusky field crossed a broad expanse lying northward of Margaritifer Sinus and Meridiani Sinus, appearing to one of us (Sheehan) to be a lava-flooded area - its outline was lobular, and suggestive of flow. This was a region which some of the classical observers covered with canals. The wide southern expanse beyond Meridiani Sinus and Margaritifer Sinus, on the other hand, including the ancient and channel-dissected region of Noachis, consisted of a rather difficult to apprehend area of subtle light and dark patches. We expended much effort in attempting to define the structure at the complex intersection where Mare Erythraeum - Coprates - and Aurorae Sinus come together, around the irregular brightish patch Schiaparelli named Capri Cornu. The Coprates - Tithonius Lacus region broke up into tiny fissures, flecks, and spots, the "gingerbread principalities" of the Martian domain and corresponding to structures along the Valles Marineris canyon system. Sheehan reported that "at times Coprates itself appeared to be accompanied by very faint etched linear structures running alongside and parallel to it. All of the desert regions, when seen under steady conditions, were covered with bright knots, pale streaks, and other features. It was easy to see how William H. Pickering could have believed he had discovered forty lakes in the Solis Lacus region." Misch's drawings, while showing many of the same features, stop short of some of the finest detail hinted at in Sheehan's. In good seeing the Valles Marineris showed extraordinary structure in the Tithonius Lacus/Noctus Labyrinthus region. Except Olympus Mons, which appeared as a bright patch, the Tharsis shield volcanoes were not definitely seen. 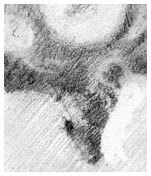 Thus, the appearance of the Tharis region was very different from that shown in Barnard's drawings of 1894, where they were recorded as large dusky spots. The latter is the characteristic appearance when fresh bright dust has been stirred up, increasing contrast between the background and the dusky tops of the volcanoes poking through it. Once the dust settles, the contrast between volcanoes and the surround decreases and the magnificent mountains camouflage themselves into the background. 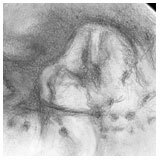 There are a number of features recorded in these drawings whose significance was not known to Barnard and other visual observers of the 19th century but are now identified as impact features. 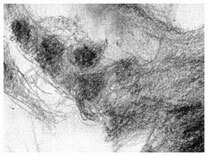 A number - but not all - of the tiny spots along the margin of Mare Erythraeum correspond to craters whose interiors are filled with coarse dust. The Argyre basin was always visible to us as a diffuse patch in southern Mare Erythraeum. Some of the irregular features in the south polar cap's outline, which early observers believed to be mountains, are actually depressed areas associated with a large impact basin that straddles the south pole of the planet. One of us (Sheehan) sometimes had impressions of "canals" in this region, or features that were interpreted as such by some observers. Notably, the boundaries of the bright streak that passes between Juventae Fons and Coprates-Tithonius Lacus, in the desert region known as Xanthe, appeared in coarse views as a double canal. However careful attention always revealed its true nature as a stretch of lighter soil projected against a duskier background. The early observers knew Solis Lacus as the "Oculus," or Eye of Mars, but their description hails from a time when the feature was round in shape and set in the midst of a quite regularly oval-shaped bright background. In fact, Solis Lacus occupies one of the most windblown - and thus most variable - parts of the planet. The dark embayment around the "Eye" often seemed to us sharply defined, and looked as if its margin had been traced with eyeliner; at times, when the seeing became steadiest, this boundary broke intor darker and lighter shapes, seen by Sheehan as "threaded with a series of dark beads." In Schiaparelli's 1877 drawings Solis Lacus appears perfectly round, in Barnard's 1894 drawings as oval and crossed by a bright band. In 2003 it appeared very complex, revealing more or less detail as conditions favored. Sheehan described it as "a complexly tousled windsock set in the midst of a boot-shaped area. Some of the winding streaks giving the impression at times of canals, but only when glimpsed in low powers or poor seeing." Solis Lacus appeared to Misch to present "a visual center of gravity, more or less rectangular, from which delicate filaments - the most canal-like features I saw anywhere on the planet - extended south and eastward, with a weightier peninsula to the west." In the moments of best seeing, these general shapes revealed another level of detail, appearing almost maddeningly complex: full of wisps, streaks, patches, all very irregular.